Yesterday, we got a look at a six-pack of images from JJ Abrams "Star Trek," an idea when we might see our first full-length trailer, the reasoning why Abrams took on the reboot project and the film's running time which is slated to release next year. Today, we got more for you! Entertainment Weekly did a in-depth interview with Abrams along with some of his co-creators and got alot more out of him concerning the treasured space traveling franchise. 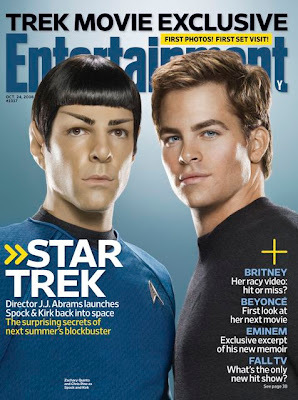 That's not all, there are 3 more photos that have found their way onto the internet, plus the cover of this week's EW, with Kirk and Spock on the cover. First and foremost Abrams gave away the official synopsis of "Star Trek." Abrams did however hold exact plot details to himself, he gave us a much clearer view of what to expect from the original story. JJ told EW, the film will span from Earth to Vulcan in a time traveling plot begining in the past where we see the USS Kelvin under a dramatic attack by the evil Romulan leader Nero, who is in search of one of the film's heroes. 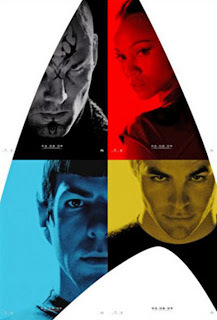 The film then brings both Kirk and Spock to center stage retelling the origin of their friendship and becoming officers aboard the USS Enterprise. The film will also introduce how the entire crew came together including Bones, Uhura, Scotty, Chekov and Sulu. The film will be Trekker friendly with a wide range of surprises and Trek lore. Abrams was sure to stress that it will be ultimately newbie-friendly. To back up Abrams ideas that the film is newbie-friendly he said, "We weren't making a movie for fans of Star Trek. We were making a movie for fans of movies." Abrams talked alot about what it meant getting Leonard Nimoy in the film and casting the right people in the characters of Spock and Kirk. JJ Abrams was so steadfast on having Nimoy in the new Star Trek, that he told Paramount executives he would not move forward on the project without him. Nimoy however was not so sure about the return. Leonard Nimoy said, "I thought Spock was behind me. I had no unfulfilled wishes." Nimoy however was continually persued by Abrams and came on board with the idea. Nimoy related, "I felt J.J. and his writers had a very strong sense of who the characters were and how they should work. To find a team that was interested in putting it all back together was very exciting." 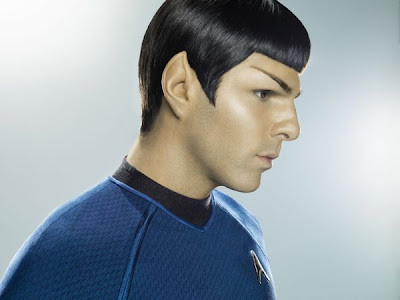 Nimoy also played a vital part in the casting of Zachary Quinto as Spock. "I could see Zach had an internal life as an actor, which is important to the Spock character, because there's so little to show physically," Nimoy says. He added, "I called J.J. and immediately told him he was going to work." Quinto also heavily persued the role of Spock. He would use his press time from Heroes to plug his desire for the job, which obviously helped his plee's. The role of Kirk wasn't as easy to find. Chris Pine said that he felt very awkward in auditions barking out "Trek jargon." 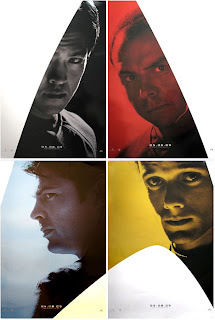 Chris Pine, who had his breakout performance in "Smokin' Aces" was among 2 other actors that were in final auditions for the role, but ultimately prevailed when Pine's and Quinto's chemistry was undeniable to exec's and Abrams. Abrams clearly explains to EW that he was never a big Star Trek fan but rather a Star Wars fan before coming aboard the project. Abrams easily sums up the Star Trek universe in two words, "Galaxy Quest." The scifi spoof film of Star Trek that starred Tim Allen and Alan Rickman. Abrams continued by saying of Galaxy Quest, "It's so ridiculous, so accurate, so sophisticated, it spoils the Star Trek universe." Abrams continued to say that what he likes so much about Star Wars is why Paramount was adamant that he took on the reboot. "All my smart friends liked Star Trek. I preferred a more visceral experience," he said. Continuing Abrams said he wanted a Star Trek movie, "that grabbed me the way Star Wars did." (I bet that quote has some Trekkers fuming right now) Abrams was given a $150 million dollar budget so that he may be able to successfully develop the Trek universe the way he intended. "We have worldwide aspirations and we need to broaden [Trek's] appeal," says Brad Weston Paramount's president of production. "Doing the half-assed version of this thing wasn't going to work." Weston finally added, "But we needed a clean, fresh take on this thing." Lost co-creator and friend of Abrams, Damon Lindelof, continued the same point by stating, "The movie, is about the act of changing what you know." Another note Abrams was sure to touch on was some of the original Cold War themes of Star Trek. "I think a movie that shows people of various races working together and surviving hundreds of years from now is not a bad message to put out right now," Abrams said. JJ continued by saying that he wanted to see a shift from the usual bleek optimism in Hollywood lately and present some totally different. "In a world where a movie as incredibly produced as The Dark Knight is raking in gazillions of dollars, Star Trek stands in stark contrast," Abrams says. "It was important to me that optimism be cool again."